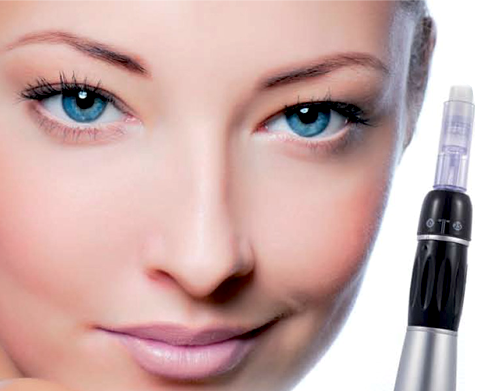 Dermapen is the brand name for the latest Meta Therapy facial treatment now available in the UK by Andrea Toth . Dermapen is the acronym for Medical & Esthetical Tissue Activating Therapy. Dermapen Meta Therapy combines the benefits of several skin rejuvenation methods in one -100% natural – unique technique for anti-ageing, rejuvenation, hydration and restoration. The skin starts showing the first signs of ageing from the age of 25. Skin becomes thinner, blood circulation deteriorates and the natural production of collagen and elastin starts to slow down, causing the skin to lose its firmness and elasticity. This natural ageing process starts from the inside out, but is also accelerated by external factors, including excessive UV light, air conditioning. Dermapen shifts the natural repair mechanism of the skin into high gear and starts producing collagen and elastin. The self-repairing property of the skin is a 100% natural form of skin renewal from the inside out. Skin ageing is tackling not just the consequences, but above all the cause of skin ageing. The result? Become your younger & fresher YOU in a 100% natural way. The skin becomes firmer and regains its elasticity, fine lines and wrinkles are visibly reduced, pores become finer, circulation is stimulated and the overall condition of the skin improves. Dermapen helps re-activate what your skin has lost over time by turning back the biological clock in a 100% natural way, giving your face a fresher and younger look.